In previous blog posts (Here and Here), we discussed the brake failure experience with our 2005 Ford Escape Hybrid ("FEH"). In our earlier posts, we provided the details regarding the failure of the regenerative braking system due to a defective master cylinder and hydraulic control unit ("HCU"). 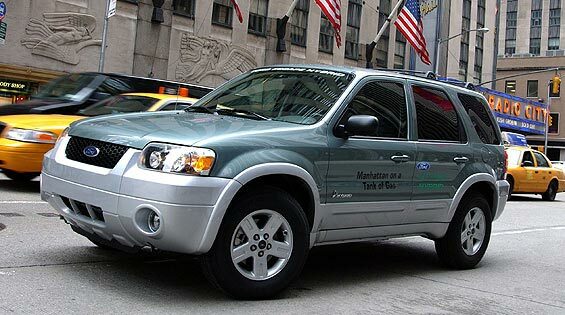 We continue to hear from many other Ford Escape and Mercury Mariner Hybrid owners who have experienced the same problem. Most all of them described the harrowing experience of having the electro-hydraulic brakes resort to failsafe mode; some resulting in accidents or near-misses. We continue to encourage anyone else who has had this problem to file a complaint with the Office of Defects Investigation ("ODI") at the National Highway Traffic Safety Administration ("NHTSA"). If you have not already done so, you can file a safety complaint at this web site...http://www-odi.nhtsa.dot.gov/ivoq/ or by calling the NHTSA Safety Hotline, Monday through Friday from 8:00 a.m. to 8:00 p.m. at (888) 327-4236, TTY: (800) 424-9153. Many new complaints have been filed since we last wrote about this problem. I have reproduced some of those below to help give you an idea of how similar the problems are amongst those who have experienced this brake failure. Details: THE BRAKES FAILED WHILE ATTEMPTING TO STOP AT A STOP SIGN. THE CAR WENT THROUGH THE STOP SIGN. A FEW MINUTES LATER WHILE DRIVING, THE ABS AND SERVICE BRAKES LIGHT CAME ON. I DROVE THE VEHICLE DIRECTLY TO THE DEALER. THEY WERE NOT ABLE TO LOOK AT IT UNTIL TWO DAYS LATER. I WAS TOLD THE BRAKE HOSES NEEDED REPLACING. I REPLACED THEM. THE BRAKES SEEMED TO BE WORKING. A FEW DAYS LATER, I GOT THE SERVICE BRAKES WARNING, AS WELL AS THE SERVICE 4X4 WARNING IN THE INFO SCREEN. THE BRAKES SEEMED TO BE WORKING. THIS TIME THEY REPLACED THE WHEEL SENSOR AT THE DEALER. ABOUT A WEEK LATER, I NOTICED THE BRAKE PEDAL WAS HARD WHEN INITIALLY PRESSED AND SOFTENED WHEN THE CAR WAS TURNED ON. I WAS DRIVING DOWN THE ROAD ABOUT 35 MPH WHEN THE SERVICE BREAKS AND ABS WARNING LIGHTS CAME ON AND THE BRAKES ONLY WORKED IF I PRESSED REALLY HARD TO THE FLOOR AND THEN IT WAS JERKY. I DROVE A SHORT DISTANCE TO RETURN FROM WHERE I STARTED AND TURNED OFF THECAR. WHEN I TURNED IT ON AGAIN A FEW MINUTES LATER, THE WARNING LIGHTS WERE OFF AND I HAD BRAKING POWER AGAIN. I DROVE A FEW MILES TO THE DEALER AND WHEN I PULLED INTO THE PARKING LOT TO PARK, THE BRAKES FAILED AGAIN AND WARNING LIGHTS CAME ON. THIS WAS A SUNDAY. THEY LOOKED AT THE VEHICLE ON MONDAY AND NOTICED THE HARD BRAKE PEDAL, BUT HE LIGHTS WERE NOT ON. THEY LOOKED AT THE COMPUTER SERVICE CODES AND INFORMED ME I NEEDED TO REPLACE THE HYDRAULIC CONTROL UNIT/ABS MODULE AND POSSIBLE THE MASTER CYLINDER AT A PRICE TAG OF $4300 - $5500+. THE PROBLEM SEEMS TO BE INTERMITTENT, BUT THE VEHICLE IS NOT SAFE TO DRIVE. I KNOW I AM NOT THE ONLY ONE WITH A 2005 HYBRID THAT HAS EXPERIENCED THIS MAJOR SAFETY PROBLEM. Details: TL* THE CONTACT OWNS A 2005 FORD ESCAPE HYBRID. THE CONTACT STATED THAT THE BRAKE WARNING LIGHT WAS ILLUMINATED. THE VEHICLE WAS TAKEN TO THE DEALER SEVERAL TIMES WHERE THE BRAKE PADS, ROTORS AND SENSORS WERE REPLACED, BUT THE FAILURE WAS NOT CORRECTED. THE VEHICLE WAS THEN TAKEN TO A LOCAL MECHANIC WHERE THE CONTACT WAS ADVISED THAT THE MANUFACTURER HAD PROVIDED A TECHNICAL SERVICE BULLETIN FOR THE VEHICLE. THE VEHICLE WAS NOT REPAIRED. THE FAILURE MILEAGE WAS UNKNOWN AND THE CURRENT MILEAGE WAS 140,000. Details: TL*THE CONTACT OWNS A 2005 FORD ESCAPE HEV. WHILE DRIVING APPROXIMATELY 30 MPH, THE CONTACT NOTICED THAT THE ABS AND BRAKE WARNING LIGHTS SUDDENLY ILLUMINATED. HE CONTINUED TO DRIVE THE VEHICLE BUT WHEN HE ATTEMPTED TO APPLY PRESSURE TO THE BRAKES, THE VEHICLE FAILED TO STOP. THE VEHICLE WAS TAKEN TO THE DEALER WHERE THEY PERFORMED A DIAGNOSTIC TEST WHICH CONCLUDED THAT THE HCU ASSEMBLY WAS FAULTY AND PERFORMED THE NECESSARY REPAIRS. THE CURRENT AND FAILURE MILEAGES WERE 100,000. Details: TL*THE CONTACT OWNS A 2005 FORD ESCAPE HYBRID. THE CONTACT STATED THAT WHILE DRIVING, THE ABS AND BRAKE LIGHTS ILLUMINATED AND THE BRAKE PEDAL EXTENDED TO THE FLOORBOARD. THE CONTACT HAD TO USE THE EMERGENCY BRAKE TO STOP THE VEHICLE. THE ELECTRONIC BRAKES FAILED TWICE AND THE VEHICLE LOST CONTROL. THE VEHICLE WAS TAKEN TO AN AUTHORIZED DEALER WHO RECALIBRATED THE HYBRID ELECTRONIC BRAKES BUT THE FAILURE OCCURRED AGAIN TWO WEEKS LATER. THE VEHICLE WAS TAKEN BACK TO THE DEALER WHO STATED THAT THE MASTER CYLINDER AND THE HYDRAULIC CONTROL UNIT NEEDED TO BE REPLACED. THE VEHICLE WAS REPAIRED. THE FAILURE MILEAGE WAS APPROXIMATELY 60,000 AND THE CURRENT MILEAGE WAS 60,500. Details: THE ISSUE I AM HAVING IS THE SAME AS DESCRIBED IN COMPLAINT #10318942. INTERMITTENTLY ON DRY PAVEMENT DURING NORMAL BRAKING, THE ABS WILL ENGAGE (WITH INDICATOR LIGHT FLASHING ON) AND YOU CAN FEEL THE TYPICAL ABS ON/OFF PULSING OF THE BRAKES IN THE BRAKE PEDAL. IT APPEARS THE CAR IS ALSO TAKING LONGER TO COME TO A FULL STOP WHEN THIS OCCURS. I HAVE REPORTED IT MULTIPLE TIMES AT THE FORD DEALERSHIP, BUT THEY ARE UNABLE TO DETERMINE THE CAUSE. THIS HAPPENS TO ME REGULARLY (A COUPLE TIMES A WEEK). 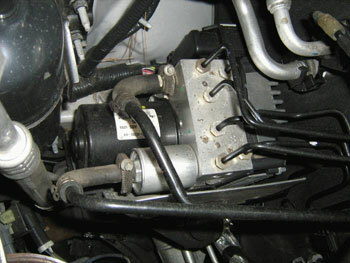 Have you heard about the power steering failure on the MMH/FEH? Message is:service power steering soon. Steering wheel is very difficult to turn. If you turn the ingnition key off and back on it temporarily fixes the problem. Anonymous - I had not heard about the power steering failure. I'll be certain to blog about it should I experience yet another issue with my FEH.